During these fun filled camps, participants enjoy themselves playing multi-sport games including but not limited to: Kickball, Relay Races, Dodgeball, Soccer, Flag Football, Wiffle Ball, and many more gymnasium activities. Each Wednesday BVSA will host a different activity such as “Slimy and Scaly” and “Music of the Animals” provided by the Stamford Nature Center. Fridays will include a fun day filled with Carnival games and prizes! 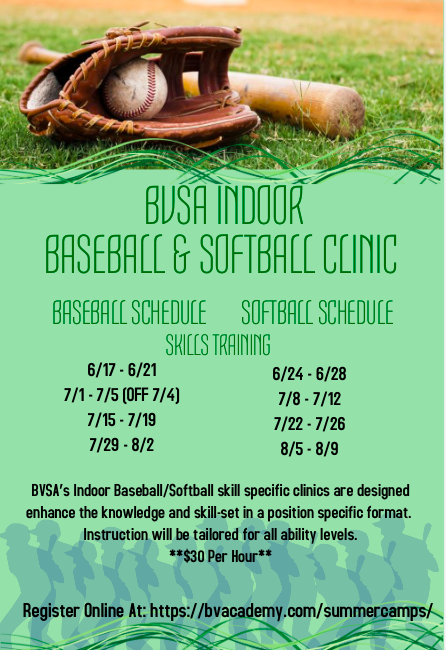 BVSA’s Indoor Baseball/Softball skill specific clinics are designed enhance the knowledge and skill-set in a position specific format. Instruction will be tailored for all ability levels.